She's currently under construction and ready to launch in July 2020. Emperor Harmoni is Emperor Divers Indonesia’s brand new liveaboard, the second for Emperor Indonesia. One of only a select few liveaboards in this region to have two engines, at 48m she happily welcomes 20 guests in spacious surroundings. 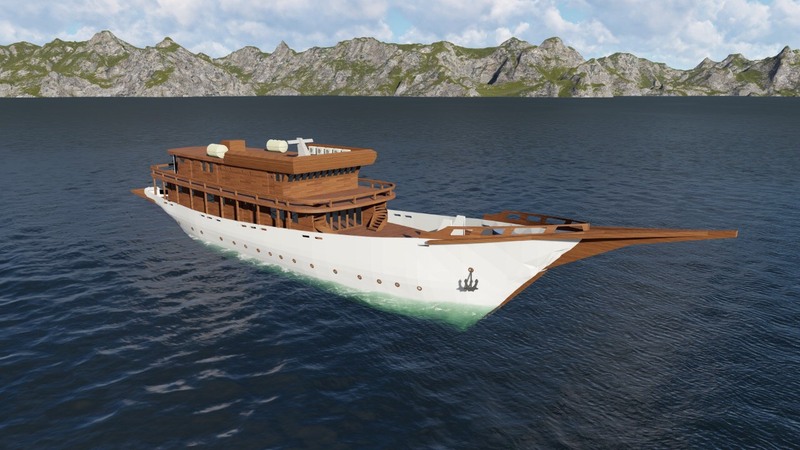 Emperor Harmoni has been designed and built taking into consideration Indonesia’s unique and diverse conditions; harnessing the Emperor Indonesia team’s extensive experience in liveaboard and charter vessels to meet the very highest standards and expectations. Built of Sulawesi Ironwood and offering a truly new experience to liveaboard holidays, experience a true sense of sailing the Indonesian seas in freedom, style, comfort and confidence with her two engines. Itineraries include Komodo, Raja Ampat and Banda Sea. Emperor Harmoni’s three decks have six guest cabins on the lower deck and four on the upper. The main deck features a spacious restaurant, lounge area with a 49" HD flat screen, digital movie and music library, board games, bar and a camera suite. Enjoy spacious diving and relaxation areas or relax with a massage on deck; whatever your choice, she’s sure to bring harmony and joy. All diving is done from two large RIBs with outboards to get you to the perfect dive spot every time. She offers free Nitrox, all diving and safety equipment including SMBs free of charge and up to four dive guides.